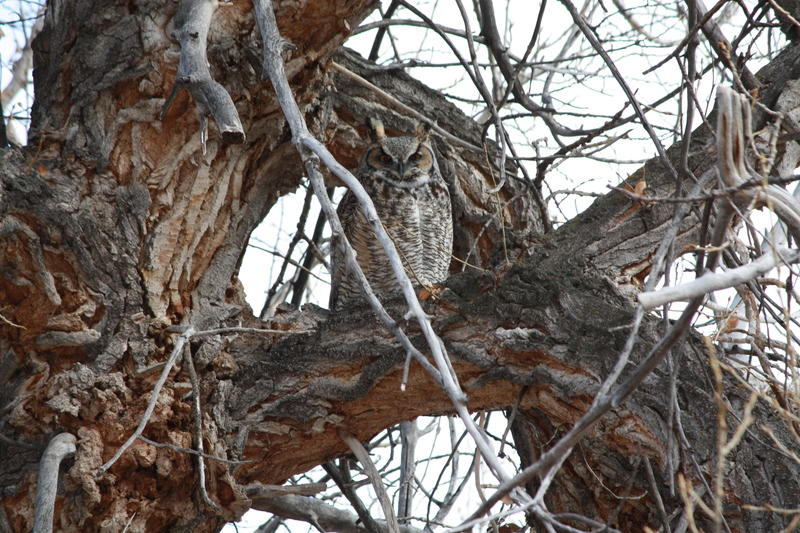 The owls appear to have settled in for the season in the cottonwoods along the creek bottom. Our first sighting was early in January, and they have made their daily presence known since then. The walk today was accompanied by an owlish serenade, which was unusual for midday. We normally hear them singing before dawn and at dusk. And lo, both owls were sighted peering down on Rosie and me as we walked the trail. Photographing owls is a tricky business, but we had some success with one shot. I worry they will find my telephoto lens threatening, as it stares right back at them.
. . . keep the noise down, I'm having my nap! After observing us these past weeks, it is our hope they are growing confident that we mean them no harm. This entry was posted in Wildlife blog and tagged owls by bygeorge. Bookmark the permalink.